There’s a kind of cowboy code I like to live by. It’s a code of the West kind of code, that I’ve modified to fit me. And what matters to me. Where I talk straight and shoot straighter – when it’s necessary to shoot. Where I only say I’m going to do what I’m really going to do – and I do it, or do my best to do it. And if I can’t, where I take responsibility for it. Where a deal can still be done on handshake, with people who have similar codes. Where chivalry is a word that means standing up for the right thing, whether you’re a man or a woman, especially when no one else is standing, and it’s the right thing to do. And where all of this as done with as much grace, and gratitude, and laughter, and love that I can muster – in a world that sometimes seems on very short supply of it. An irony, considering love, like air, is somewhat infinite. What I love about living here, at the end of a dock in a gem of a Bay in a community of people who prefer the movement of the sea to the seeming solidity of land… is that there are more than a few of us, who run on some kind of cowboy code. It’s like a jet fuel through our engines, born of itdoesn’tmatterwhat, but resulting in – people who listen to people. And people who help people. And people who check in on other people. And people who don’t fuss about listening or helping or checking in – because there’s no time for it, in a lifestyle where forgetting to seal a leak sends your boat, eventually, to the bottom of the ocean. And where forgetting to check a mooring line, could send you, softly snoring, gently drifting, to the other side of the Bay. While these sorts of mishaps, in a life of seadrunk starfired adventure, happen rarely… they do happen, some more sorrowful than others. After one of the great storms, I helped – along with several others – a sailor retrieve his possessions from his drowned boat. It went down quickly, when it went – and he was fortunate enough to be able to retrieve even a couple of items. He had come to Canada from East Germany, some years ago… escaping over that now-long-gone Wall, to find a life of freedom. And while he lost his boat, he and several cowboy-coded locals helped save his life, and some of his treasured belongings… in this place that he calls home, in a country called Canada, and a bay called Cowichan, by those who first built their lives here. 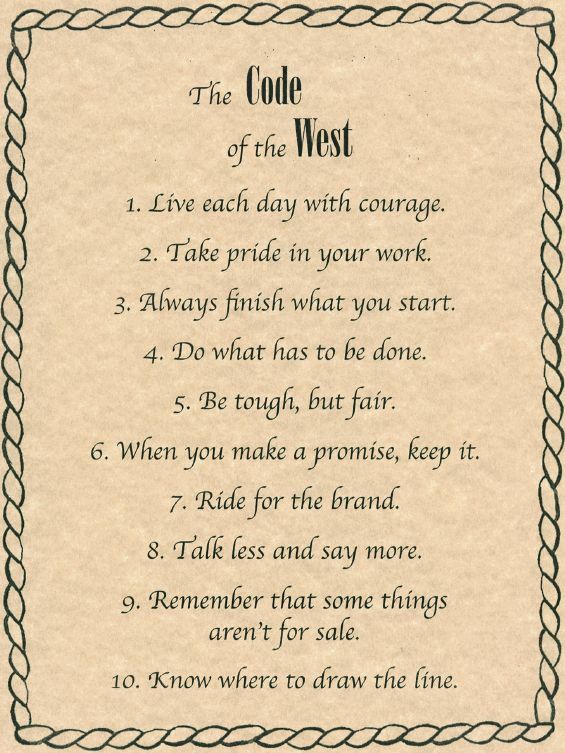 Post Scriptum: Here is the Code of the West, as written by some old trailriders a century or so ago… re-invented by various modern cowboys… and in my own way, by me.